A part-fortress, part-chateau, part-feudal, part-Renaissance town with its imposing charming chateau is a must to visit. Saturday Market and many festivals and music events throughout the summer. An amazing firework display and festival to celebrate Bastille Day on the 14th July. Only 15 minutes drive south east of us, 570 acre lake with man made beach, boating, fishing and golf. Plenty for the kids to do. Market day Friday morning. Pontivy, which is 25 minutes away, is a large town with a beautiful Chateau and old town quarter. Formerly named Napoleonville after his design of the new town, it has a beautiful setting on the Nantes-Brest canal and has everything you could possibly need for a day’s excursion. Beside the River Blavet in the very middle of Brittany – the capital of the province. There are some lovely restaurants and very nice shops! Large town about 20 minutes drive west. Large indoor swimming pool – lots of shops/bars and supermarkets, lovely lake with walks and play areas for the children..
Old cotton mill town, lots of character, lovely shops and bars, chateau, river with boat trips etc. Market every other Thursday. About 5 mins drive north of us, with Garden Centre, shops, bars and restaurants. Maritime Two floors of the Chateua house collections presenting the maritime and rural traditions in the vilaine estuary. Its three majestic towers leaning the Oust Valley and its splendid facade in gothic flaming style allows Josselin to display an outstanding example of medieval architecture. This castle keeps the memory of Raoul de Montfort. Built on the edge of a peaceful lake Comper is the legendary place where one says Vivien brought up Lancelot. The history of this castle goes back as far as the third century. T retains fine elements of XIV century military architecture. Erected on the edge of the forest. During the revolution Suscinio was ruined by vandalism. It is now fully restored and features a museum and festivals are organized during the summer. Lac de Guerledan, the largest lake in Brittany. You can enjoy various water sports such as water skiing or swimming, or hire a motor boat, canoe, kayak, rowing boat, dinghy or pedalo, or enjoy a lake cruise. Take dinner one evening during the summer on a floating restaurant. There are great places to eat and drink onshore and three small beaches which offer safe bathing for children. There are also timed walking routes around the lakes perimeter with varying distances and times. Alternatively, if you wish it quieter, Lac Bosmeleac, 7 miles by road, offers a more tranquil setting. With one restaurant overlooking the lake. This also has mapped timed walking routes of varying distances. The local area is ideal for bike riding with many small quiet country lanes to explore. Cycle along the tow path of the Nantes/ Brest canal or from Carhaix to Loudeac passing by Lac Guerlédan you can now cycle along the 111 kilometre long consolidated sand trail following the tracks of the old railway line.If you want to leave the track there are 24 round trips which vary in length from 4 ½ to 16 ½ km. Equestrian Activities – There are a number of ‘poney clubs’ in the area where you can hire a hack by the hour, around 15 euros, or for the day at about 75 euros, or you could have lessons and learn to ride. There is Guerlédan Riding school near the lake and there is a horse museum in nearby Corlay. Markets – The nearest is at Mur de Bretagne on a Friday evening with the main part in the square but also dotted along the side streets. Traditional Breton dancing and lots of different general stalls, food, plants clothes etc and also live chickens/turkeys and ducks. Large amusement park at Begard with an indoor and outdoor pool with cascades, three water slides, trampolines, bowling, 130 metre toboggan run, water chutes, bumper boats, pedal karts and buggies, mini golf, summer sledge, toddlers playground. Restaurant and café. set in 12 hectares of woodland between Rennes and Saint Malo offering some 30 activities including a carousel, mini golf, go karting, The Rapids( descend in inflatable boats),monkey bridges, trains, wildlife museum, swimming pool with chutes, quad track, bouncy castles. Restaurant and café. Les Aquatides – Leisure centre at Loudeac with 70 metre giant waterslide swirling river, play area for toddlers with fountain, paddling pool and mini pool. Leisure /amusement park 5 minutes from Brest with carousel, giant slide, lake, dodgem boats, little train, wild ride, trampolines, cable car, bouncy castles, go-karting, aquapistol, pirate ship, scenic railway, The volcano, The Tempest, mini farm and river splash and a 500 metre summer toboggan run. Restaurant and café. Founded twenty years ago this zoo in the Ic valley allows you to travel from island to island and observe the Monkeys, Lions, Sumatran tigers, Wallabies, Kangaroos etc. See more than 300 tortoises living in the large landscaped gardens, some weighing more than 100 kg and more than a 100 years old. Crocodiles, Caimans and Alligators. Visit the large reptile house, with tunnels, ladders you can climb, pyramids and glass towers with boas, pythons, iguanas, monitor lizards and chameleons. Large ocean Discovery Park near Brest. Visit the three thematic pavilions Polar, Tropical and Temperate containing 10,000 animals representing 1000 species. Recreated habitat in the polar pavilion with 40 penguins. Real pack ice for the seals of the far North! Enjoy watching the seals play. Huelgoat Forest is located halfway between Morlaix and Carhaix. The forest covers 10 sqkms and can be accessed from Huelgoat village. Its enchanted atmosphere comes from its caves, moss-covered boulders and amazing rock formations, such as ‘the mushroom’ and ‘the trembling rock’ which can be rocked by one person – if you know where to apply pressure. It is also steeped in Arthurian legend – explore Arthur’s camp and visit Arthur’s cave. There are marked trails and circuits. Head west from Rennes and you reach the Foret de Paimpont, also known by its ancient name, Broceliande. According to song and legend, Broceliande is the forest of Merlin from Arthurian legend. The Foret de Paimpont is located in a tranquil part of Brittany with few tourists – an ideal location for a ramble away from it all. you can enjoy a walk to La Fontaine de Barenton or ‘Merlins Spring’ as it is sometimes known. The Fountain of Eternal Youth is hidden away nearby and is said in legend to be only accessible to those pure of heart. Why not talk a walk into ‘The Valley of No Return’ (thankfully not true) and discover a steep valley from which exits are barred by thickets of gorse and furze on the rocks above you. The town of Carnac is home to around 2000 standing stones which stretch for over 4km to the north of the village. The Carnac Stones (or alignments, as they are known) make up the most important pre-historic site in Europe. They even pre-date the Pyramids, Stonehenge and the great Egyptian temples of the same name at Karnak. Over the centuries, the sea has withdrawn, leaving the Carnac Stones a few kilometres inland, which means you can combine a visit to the stone alignments with a stay in the seaside resort of Carnac-Plage. The Carnac Stones are said to have been an observatory for the motions of the moon – a sort of three-dimensional graph paper, used for plotting the movements of heavenly bodies. History has seen them used as quarried stone, and dug up and removed by farmers to protect their precious crops from academics visiting the alignments when pre-historic archaeology became popular. Unfortunately, due to visitor numbers, the principal Carnac alignments have now been fenced off, and visitors are no longer free to wander at will amongst them. The Pointe du Raz, known as the Land’s End of both Finistere and France, has been designated a “Grande Site Nationale” It is a dramatic visit, especially the deep fissures which fill and drain with a deafening surf-roar. Alternatively, you may care to take a stroll to the Baie des Trepasses (the Bay of the Dead) situated 30km west of Douarnenez, which gets its name from the shipwrecks there and is a possible site of the lost city of Ys. It is a very attractive spot and has some of the best surfing conditions in Brittany. It is sometimes possible to make out the harbourside white-painted houses on the Ile de Sein across the waves, while the rocks in between sport an array of picturesque Brittany lighthouses. There are 38 Regional Natural Reserves in France and 7 National Parks. Armorique National Park was created in 1969 and covers an area of 172,000 hectares, including 60,000 hectares of marine land. It includes a large variety of landscapes and activities which represent the ecological, economic and cultural diversity of Brittany and is well worth a visit. For a visit to the parishes of Finistere, Morlaix makes an excellent base. Parish closes, or enclose paroissiaux are walled churchyards incorporating cemetery, calvary and ossuary, and celebrate the distinctive character of Breton Catholicism in elaborately sculpted scenes. Stone calvaries are often covered in detailed scenes of the Crucifixion above a collection of saints, gospel stories and legends. In richer Brittany parishes, a high stone arch leads into the churchyard and there may be an adjoining ossuary. This is where bones would be taken when the tiny cemeteries filled up. The Parishes of Finistere hold annual Pardons to show devotion to a particular Saint, from whom a pardon is requested. Mass is followed by a procession of banners, relics, statues and crosses carried by a cortege singing the canticles. 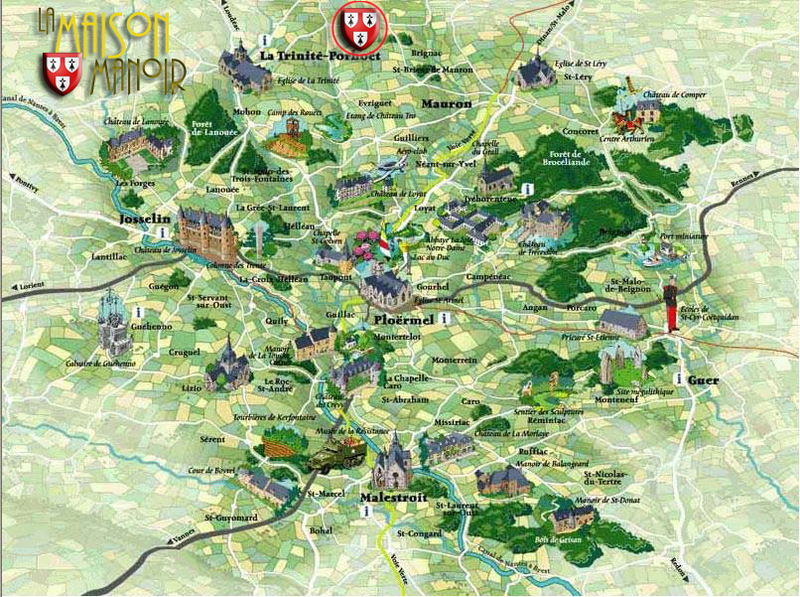 Locronon is home to one of the largest yearly pardons. The most famous enclos are in the neighbouring parishes of Morlaix and Landivisiau on a clearly signposted route. At St-Thegonnec, the entire east wall of the church is a carved and painted frame, with saints in niches and a hundred scenes depicted. The pulpit and the painted oak entombment in the crypt beneath the ossuary are acknowledged masterpieces. Further impressive closes can be found at La Roche, La Martyre and its adjoining parish Ploudiry. Dol-de-Bretagne, 30km west of Mont St Michel, was an important bishopric during the Middle Ages. Dol-de-Bretagne no longer has a bishop, though it still has its granite cathedral complete with ornate tiled towers. Cathedraloscope in Dol-de-Bretagne’s central square explains how medieval cathedrals were constructed. Also located in the square is the Musee Historique de Dol that has 2 two rooms of wooden artifacts from Breton churches. Dol-de-Bretagne has picturesque streets, most notably the pretty Grande-Rue, where an assortment of 500-year old half-timbered houses look over the shoppers below. The former island of Mont Dol, now located 8km inland from the sea, is a granite outcrop and the legendary site of a battle between Archangel Michael and the Devil. Various indentations in the rock such as “Devils Claw” show the savagery of the battle, which saw the Devil defeated. The site has been occupied since pre-historic times, with remains of mammoths and sabre tooth tigers found there. Later on, Mont Dol became an island monastery like Mont St Michel although all traces of this have long vanished. Why not head to the small chapel on top of Mont Dol and enjoy a pleasant climb winding among the chestnut and beech trees. Cancale is a delightful seaside resort renowned for its delicious fresh oysters. Found in the camps of Julius Caesar and taken to Versailles for Louis XIV, Cancale’s oysters are without doubt something special, even accompanying Napoleon on the march to Moscow. At low tide, it is possible to see where the oysters are grown; the prime location is next to the jetty on rue des Parcs where the beach is covered with generations of empty shells. Cancale’s port area is very pretty with a number of glass-fronted restaurants, many offering oyster-tasting. Enjoy a coffee in town and stroll among the stalls selling shellfish and fish, or take a walk along the coastal path which leads to the Pointe de Grouin and offers stunning views of Mont St Michel. The town of Fougeres is built on a huge granite ledge and was a heavily fortified strategic site in medieval times. Today, Fougeres is a town of art and history. The topography of Fougeres is particularly interesting. Streets that look just a few metres long on a map turn out to be long plunges down several levels of this split-level site; and lanes turn into flights of steps. The dominant feature of Fougere is the Chateau which was built below the level of the main part of town, on a low spit of land that is towered over by, 2 huge rock faces. Although protected by a moat full of weirs and waterfalls, the site was a defence failure and was repeatedly captured by medieval adventurers including du Guesclin, Constable of France from 1370 to 1380. Approach Fougere’s castle from Place des Arbres beside St-Leonard’s church for a scenic entrance. Footpaths, ramps and stairways drop down through successive tiers of pretty public gardens. The walk offers fantastic views of the ramparts and towers and eventually reaches the water meadows of the River Nancon, which are crossable beside a pretty little cluster of medieval houses on the riverbank. Why not pay a visit to the Foret de Fougeres, towards Vire. The beech tree woods are beautiful, with various stone structures and long forgotten trails of old stones scattered amongst the spruce, plus a number of dolmens (burial chambers. The pretty town of Pont-Aven is situated just east of Concarneau inland from the tip of the Aven estuary. It is a picturesque port popular with tourists due in part to its art galleries. The artist Gauguin came to Pont-Aven in the 1880s to paint before leaving for Tahiti. Gauguin produced some of his best works in Pont-Aven, and his influence was such that the Pont-Aven School of fellow artists was founded here – the best known of these artists was Emile Bernar. It is unfortunate however that the town has no permanent collection of Gauguin’s work. The promenade Xavier-Grall criss-crosses the tiny river in the heart of Pont-Aven and offers glimpses of fashionable mansions, draped in red ivy. Enjoy a longer walk into the Bois d’Amour, pretty wooded gardens, which have long provided inspiration to painters, poets and musicians.